Get ready to laugh and get chatty again in 2013 with Bravo's first lady of 'Komedy' with a capital 'K', Kathy Griffin. Her talk show is back for a sophomore season and you just know the comedienne isn't afraid to ask the difficult questions, or go too far every time. An an extra treat today here's another fun Kathy Griffin billboard spied along L.A.'s Sunset Strip on April 25, 2009, this one for when she was hosting Bravo's A-List Awards. 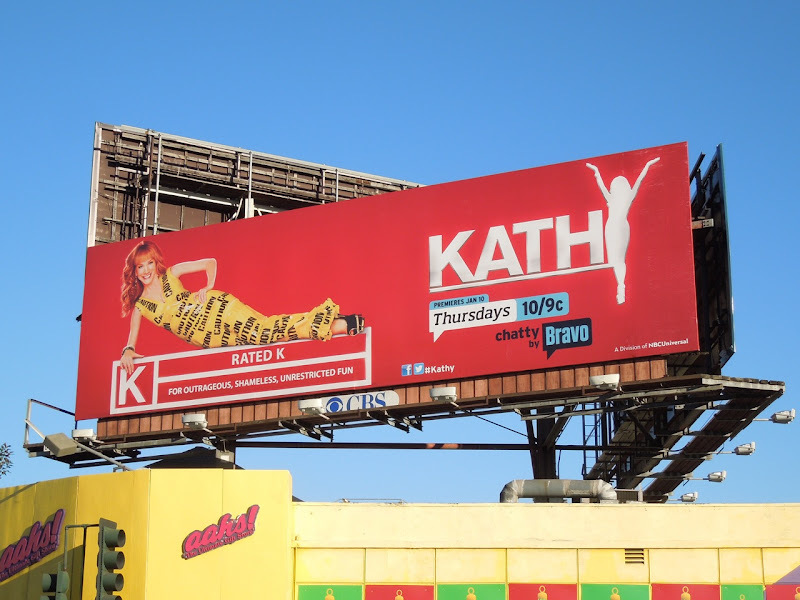 The new red hot Kathy billboard was snapped along Sunset Boulevard at San Vicente Boulevard on December 20, 2012. If you're a fan of the outrageous comedienne, be sure to check out the Kathy chat show season one billboard.